The event was created three years ago to thank the businesses that not only do business in the Madison communities, but who also support local organizations, the schools and sports teams. Madison Township Trustee Ken Gauntner made the first presentation of the night to Madison Country Club on Chapel Road, which he said was an old and new business. The Country Club used to be private, then it was purchased by Rollin Cooke and became public. Present to accept the award were Kevin Leymaster, director of golf operations and Matt Evans, managing partner at Madison Country Club. Gauntner encouraged everyone to play the course, and spread the word it can be used for golf outings. He said he could personally see the work being done on the golf course to ready it for the season from his back yard. “I just want to thank everybody, especially Kenny,” Leymaster said. The second presentation was made by Village Council Member Ken Takacs to Northeast Ohio Insurance (NEO) Agency on West Main Street. Accepting the plaque were Bill Ritt, Jr. and Jim Ritt. “My father got into the insurance business in 1971 and in 1993 he had an opportunity to talk about purchasing other businesses and we bought NEO Insurance when it became available,” Ritt, Jr. said. “We decided Madison was an area we wanted to move to; it was a growing community. I’ve been in the business now 41 years and my brother Jim came into it 29 years ago. Ritt said they have tried different ways of marketing, but word of mouth has worked best for them, adding they now had a third generation in the business. Takacs added they were proud of the business. Township Trustee Pete Wayman’s choice was the Wagon Wheel Bar and Restaurant by Madison Township Park. The Board of Trustees just re-appointed him to the Rec Board again. “His footprint will be in Madison for a long time for the things that he’s done,” Wayman said. Sorensen thanked everyone and credited his and his wife’s parents for their interest in giving back to the community. He said they were proud of what they had done and noted this will be the eighth year for Light Up the Park. “Last year we had over 12,000 people; it’s something that brings the community together every year,” Sorensen said. Wayman also thanked Sorensen for the new stairs and three decks going down to the beach that the Light Up the Park Committee paid for with event proceeds. Village Council Member Jay Adams filled in for Mayor Sam Britton in presenting a plaque to Krew Cuts on N. Lake Street. “Sara and Michelle took over the business and, as most people know, they’ve been working their way down (Hubbard Road)—and finally made it to the Village,” he said. Sara said Tim Chapman, the previous owner, had hired her right out of high school after taking her resume at Auburn Career Center. Michelle Chapman echoed Sara’s sentiments. Trustee Max Anderson selected Brotzman’s Nursery to recognize. The family members who came to accept the plaque included Tim Brotzman, his wife Sonja, his daughter Hillary Brotzman, his brother-in-law Napoleon Hidalgo, and his brother Jeff Brotzman and sister Joanna Brotzman. Brotzman said his father Charlie came from a long line of Madison agricultural people. “He was very proud to carry on Madison’s agricultural traditions,” Brotzman said, adding a bit of family history. The last business to be recognized was Wirtzberger Enterprise Inc., a full-service construction company. Bailey said it was started in 1985 by Michael Wirtzberger, and was now run by his daughter, CEO Megan Herrick. Bailey said they asked the hotels coming to the Village to make use of local tradesmen and, he was happy to say, Wirtzberger was doing a lot of work for them. Unfortunately, no one was able to attend to accept the plaque. Following the last presentation, the business representatives were invited to sign the Madison Means Business banner which hangs in Madison Village Hall. 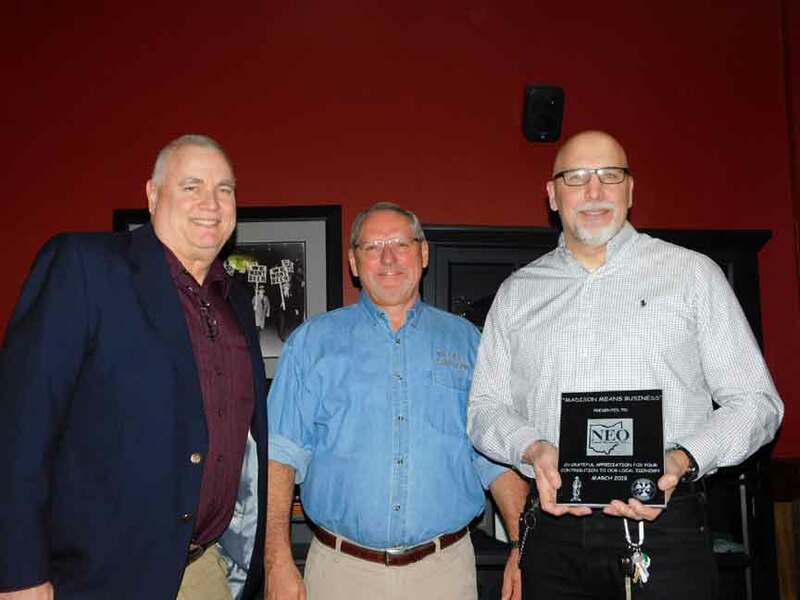 Madison Village Council Member Ken Takacs, center, joins Madison Means Business award recipients Bill Ritt, Jr. and Jim Ritt of Northeast Ohio Insurance (NEO) Agency on West Main Street on March 21.